National Baptist Convention - Envisioning the Future Exceptionally - Enroll America Affordable Care Act Update - Enrollment Deadline is January 31st! 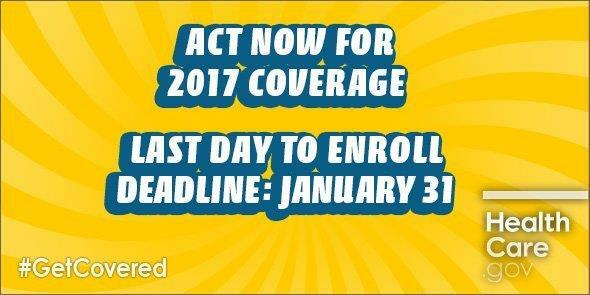 Enroll America Affordable Care Act Update - Enrollment Deadline is January 31st! We’ve all heard the news about President Trump’s executive order on the ACA. So, we’re forwarding the latest talking points from Enroll America below. As a reminder, we’re non-partisan on the political debate about the ACA. We’ll continue to share the facts about its benefits to those covered and promote healthy living choices. I hope that we’ll all have pictures to share from Wear Red Sunday – February 12. Our photographs will give further support to our health and wellness activities. H.O.P.E. Ministry, National Baptist Convention, USA, Inc. Ever since the election, we know that consumers, navigators, and partners have expressed concerns and asked questions about the future of the Affordable Care Act and the availability of quality, affordable health coverage through the Marketplace. That is particularly true for the more than 12 million Americans who have come to count on the coverage they’ve purchased through the Affordable Care Act marketplace, and more than 16 million who have gained coverage through Medicaid since 2013. Both groups are deeply worried about what repealing the Affordable Care Act without an adequate replacement would mean for their health, their families, and their financial security. Those questions have only grown since Congress took the initial steps towards repeal. But it’s important to know that as of now, nothing about the Affordable Care Act marketplace has changed, and consumers who enroll by the January 31 deadline will have coverage starting March 1. Open enrollment is ongoing right now, and consumers should continue to enroll. And in fact, that is just what is happening: according to the Department of Health and Human Services, over 11.5 million enrolled in coverage by December 24, an increase of 286,000 people compared to the same period last year. The fact that so many Americans have continued to enroll in coverage even in the face of such political uncertainty and negative coverage is a testament to the ongoing need for the affordable, quality coverage options provided by the Affordable Care Act. We know that consumers have questions about repeal efforts and the implications for their coverage moving forward, and we will continue to pay close attention to this issue. If anything were to change about coverage options for 2017, our staff, volunteers and partners will be available to help consumers understand what that means for them. But right now, it is critically important for consumers to understand that nothing has changed. We’ve already accomplished a lot during this enrollment period, and the excitement we’ve seen from consumers, and the dedication and energy we’ve seen from the enrollment community, makes us optimistic about what we can accomplish in the final push to the January 31 enrollment deadline. Q. I heard that Congress already voted to repeal the Affordable Care Act? Is that true? If so, that means I can’t enroll in coverage, right? The details are a bit complicated, but the bottom line is that while Congress has kicked off a process that could eventually result in the repeal of the Affordable Care Act, as of now, nothing has changed and enrollment continues. It’s true that both the House and the Senate voted on a budget resolution that kicks off a multi-step budget process that could result in the repeal of parts of the Affordable Care Act. But a budget resolution is not law, and it does not go the president for a signature. There are a number of steps necessary – including committees crafting legislation, House and Senate votes, a conference committee to resolve differences, and final House and Senate Votes – before any repeal legislation would take effect. So as of now, nothing has changed about the Affordable Care Act – not plans, not prices, and not enrollment deadlines. And while repeal is not a certainty, even if repeal does take place, it’s likely that most consumers who are already enrolled with an insurance company for 2017 coverage will be able to keep their coverage. So it’s very important that consumers take action before the deadline to get the coverage they and their families need. Q. What do you think President Trump and the Republican Congress will do about the Affordable Care Act moving forward? I can’t speculate about what actions the President or Congress might take in the future. What I can say is that as of now, nothing has changed about the fourth enrollment period – not dates, not plans, and not prices. “Full repeal on Day 1” was not a possibility because of the 60 vote threshold to move legislation in the Senate. And only certain parts of the law could be repealed through the budget reconciliation process (which only requires a simple majority to pass). A failed repeal effort in 2015 built in a two-year transition time before changes took effect for consumers; so even if reconciliation legislation is used to roll back parts of the Affordable Care Act, it’s likely that 2017 plans will remain in place. That’s particularly true because both issuers and Members of Congress have expressed a desire to avoid disruptions and do no harm to consumers already in the system. Navigators in the HealthCare.gov states are already funded through September 2017, and that funding can’t be revoked. That means free, expert assistance will continue to be available to consumers throughout the enrollment period and beyond. So the bottom line is that as of now nothing has changed, and consumers can still enroll in affordable coverage that will help to meet their families’ health care needs. Q. But how can you in good faith tell consumers to enroll when elected leaders have clearly said they will repeal the law? Because it’s absolutely true that as of now, nothing has changed. Consumers can enroll in coverage right now, pay their premium, and begin using their insurance for medical care on March 1. And consumers who apply and are eligible for Medicaid can enroll and begin getting services as soon as they enroll. And for those who haven’t yet enrolled, it’s not too late. They have until January 31 to enroll, and can receive financial help to enroll in coverage, and use that coverage to access care. That is an incredibly important opportunity for millions of American families, and we want to make sure they know it is still available to them. Q. What about the recent executive order? Did that repeal the mandate, or change things for people who need to enroll? No, the executive order did not change anything for people who want to enroll. The deadline is still January 31, financial assistance is still available, and consumers can still find quality, affordable plans through the health insurance marketplace. The executive order just reaffirmed what the Trump Administration has already said about their intentions, and instructed agencies to begin thinking about how to implement the Affordable Care Act according to the priorities of the new administration. Actually changing the law will require Congressional action, and as I already mentioned, as of now, absolutely nothing has changed. Q. What are you doing to get the word out to consumers who make think that Obamacare has already been repealed? All of our staff and our thousands of partners are already actively engaged in reaching out to consumers to enroll in coverage during the open enrollment period, and energy and enthusiasm has been high. So they are all perfectly positioned to let consumers know that – despite what happened in the election and the uncertainties ahead for the Affordable Care Act – they are still able to get financial help and enroll in a plan right now. We’re taking an all-of-the-above approach to spreading that message, through national and local press, our EA newsletters and thousands of partners, shareable graphics for FB and Twitter, and through our popular digital tools like the Get Covered Connector. Right up to the deadline, we’ll be working tirelessly to spread the word and help as many people as possible enroll in or renew their coverage.